Catania (Italian: ( ); Greek: Κατάνη, Ancient Greek: ; Latin: Catana, pronounced , and Catina) is an Italian city on the east coast of Sicily facing the Ionian Sea, between Messina and Syracuse. 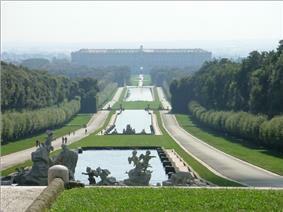 It is the capital of the Province of Catania, and is the second-largest city in Sicily and the tenth in Italy. Catania is known for its seismic history, having been destroyed by a catastrophic earthquake in 1169, another in 1693, and several volcanic eruptions from the neighboring Mount Etna volcano, the most violent of which was in 1669. 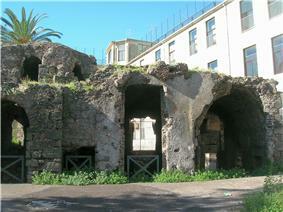 Catania has had a long and eventful history, having been founded in the 8th century BC. 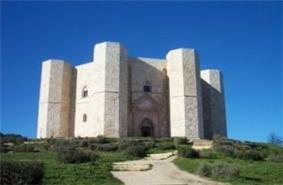 In 1434 it witnessed the opening of the first university in Sicily. Then in the 14th century and into the Renaissance, Catania was one of Italy's most important and flourishing cultural, artistic, and political centers. Catania is located on the east coast of the main island of Sicily, at the foot of the Mount Etna. Under the city runs a subterranean river, the Amenano, surfacing at just one point, south of Piazza Duomo, and the river Longane (or Lognina). The ancient indigenous population of Sicels named their villages after geographical attributes of the locations. The Sicilian word, katane, means "grater, flaying knife, skinning place" or a "crude tool apt to pare". This name was adopted by Greek colonists. Other translations for the name are "harsh lands", "uneven ground", "sharp stones", and "rugged or rough soil". The latter etymologies are easily justifiable since, for many centuries, the Metropolis of Etna has always been rebuilt within its typical black-lava landscape. Around 729 BC, the archaic village of Katane became the Chalcidian colony of Katánē where the native population was rapidly Hellenized. The Naxian founders, coming from the adjacent coast, later used the primal autochthonal name for their new settlement along the River Amenanus. Around 263 BC, the Etnean Decuman City was famous as Catĭna and Catăna. The former has been primarily used for its supposed assonance with "catina", the Latin feminization of the vocable catinus. Catinus hides two meanings: "a gulf, a basin, a bay" and "a bowl, a vessel, a trough". Both explications may be admissible, thanks to the city’s distinctive topography. Around 900, when Catania was part of the the leguminous plants" (in Arab Qataniyy), whose feminized collective suffix is iyah. Pulses like lentils, beans, peas, broad beans, and lupins were chiefly cultivated in the Catanian Plain before the arrival of Aghlabites' soldiery from Tunisia. Afterwards, many Islamic agronomists will be the principal boosters and those who over-cultivated the citrus orchards in the greater part of Sicily's ploughlands. Lastly, Wadi Musa denotes the River or the Valley of Moses (Arab name of the Simeto River), but this denomination was rarely used. All ancient authors agree in representing Catania as a Greek colony named Κατάνη (Katánē—see also the list of traditional-Greek place names) of Chalcidic origin, but founded immediately from the neighboring city of Naxos, under the guidance of a leader named Euarchos (Euarchus). The exact date of its foundation is not recorded, but it appears from Thucydides to have followed shortly after that of Leontini (modern Lentini), which he places in the fifth year after Syracuse, or 730 BC. The only event of its early history that has been transmitted to us is the legislation of Charondas, and even of this the date is wholly uncertain. But from the fact that his legislation was extended to the other Chalcidic cities, not only of Sicily, but of Magna Graecia also, as well as to his own country, it is evident that Catania continued in intimate relations with these kindred cities. It seems to have retained its independence till the time of Hieron of Syracuse, but that despot, in 476 BC, expelled all the original inhabitants, whom he established at Leontini, while he repeopled the city with a new body of colonists, amounting, it is said, to not less than 10,000 in number, and consisting partly of Syracusans, partly of Peloponnesians. He at the same time changed the city's name to Αἴτνη (Aítnē, Aetna or Ætna, after the nearby Mount Etna, an active volcano), and caused himself to be proclaimed the Oekist or founder of the new city. As such he was celebrated by Pindar, and after his death obtained heroic honors from the citizens of his new colony. But this state of things was of brief duration, and a few years after the death of Hieron and the expulsion of Thrasybulus, the Syracusans combined with Ducetius, king of the Siculi, to expel the newly settled inhabitants of Catania, who were compelled to retire to the fortress of Inessa (to which they gave the name of Aetna), while the old Chalcidic citizens were reinstated in the possession of Catania, 461 BC. The period that followed the settlement of affairs at this epoch appears to have been one of great prosperity for Catania, as well as for the Sicilian cities in general: however, no details of its history are known till the great Athenian expedition to Sicily (part of the larger Peloponnesian War). On that occasion the Catanaeans, notwithstanding their Chalcidic connections, at first refused to receive the Athenians into their city: but the latter having effected an entrance, they found themselves compelled to espouse the alliance of the invaders, and Catania became in consequence the headquarters of the Athenian armament throughout the first year of the expedition, and the base of their subsequent operations against Syracuse. 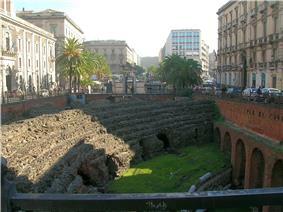 There is no information as to the fate of Catania after the close of this expedition: it is next mentioned in 403 BC, when it fell into the power of Dionysius I of Syracuse, who sold the inhabitants as slaves, and gave up the city to plunder; after which he established there a body of Campanian mercenaries. These, however, quit it again in 396 BC, and retired to Aetna, on the approach of the great Carthaginian armament under Himilco and Mago. The great sea-fight in which the latter defeated Leptines, the brother of Dionysius, was fought immediately off Catania, and the city apparently fell, in consequence, into the hands of the Carthaginians. Callippus, the assassin of Dion of Syracuse, when he was expelled from Syracuse, for a time held possession of Catania (Plut. Dion. 58); and when Timoleon landed in Sicily Catania was subject to a despot named Mamercus, who at first joined the Corinthian leader but afterwards abandoned his alliance for that of the Carthaginians, and was in consequence attacked and expelled by Timoleon. Catania was now restored to liberty, and appears to have continued to retain its independence; during the wars of Agathocles with the Carthaginians, it sided at one time with the former, at others with the latter; and when Pyrrhus landed in Sicily, Catania was the first to open its gates to him, and received him with the greatest magnificence. Xenophanes, the philosopher of Elea, also spent the latter years of his life there, so that it was evidently, at an early period, a place of cultivation and refinement. The first introduction of dancing to accompany the flute, was also ascribed to Andron, a citizen of Catania. In ancient times Catania was associated with the legend of Amphinomus and Anapias, who, on occasion of a great eruption of Etna, abandoned all their property, and carried off their aged parents on their shoulders, the stream of lava itself was said to have parted, and flowed aside so as not to harm them. Statues were erected to their honor, and the place of their burial was known as the Campus Piorum; the Catanaeans even introduced the figures of the youths on their coins, and the legend became a favorite subject of allusion and declamation among the Latin poets, of whom the younger Lucilius and Claudian have dwelt upon it at considerable length. The occurrence is referred by Hyginus to the first eruption of Etna that took place after the settlement of Catania. In the First Punic War, Catania was one of the first among the cities of Sicily, which made their submission to the Roman Republic, after the first successes of their arms in 263 BC. The expression of Pliny (vii. 60) who represents it as having been taken by Valerius Messalla, is certainly a mistake. It appears to have continued afterwards steadily to maintain its friendly relations with Rome, and though it did not enjoy the advantages of a confederate city (foederata civitas), like its neighbors Tauromenium (modern Taormina) and Messana (modern Messina), it rose to a position of great prosperity under the Roman rule. Cicero repeatedly mentions it as, in his time, a wealthy and flourishing city; it retained its ancient municipal institutions, its chief magistrate bearing the title of Proagorus; and appears to have been one of the principal ports of Sicily for the export of corn. It subsequently suffered severely from the ravages of Sextus Pompeius, and was in consequence one of the cities to which a colony was sent by Augustus; a measure that appears to have in a great degree restored its prosperity, so that in Strabo's time it was one of the few cities in the island that was in a flourishing condition. It retained its colonial rank, as well as its prosperity, throughout the period of the Roman Empire; so that in the 4th century Ausonius in his Ordo Nobilium Urbium, notices Catania and Syracuse alone among the cities of Sicily. One of the most serious eruptions of Mount Etna happened in 121 BC, when great part of Catania was overwhelmed by streams of lava, and the hot ashes fell in such quantities in the city itself, as to break in the roofs of the houses. Catania was in consequence exempted, for 10 years, from its usual contributions to the Roman state The greater part of the broad tract of plain to the southwest of Catania (now called the Piana di Catania, a district of great fertility), appears to have belonged, in ancient times, to Leontini or Centuripa (modern Centuripe), but that portion of it between Catana itself and the mouth of the Symaethus, was annexed to the territory of the latter city, and must have furnished abundant supplies of grain. The port of Catania also, which was in great part filled up by the eruption of 1669 AD, appears to have been in ancient times much frequented, and was the chief place of export for the corn of the rich neighboring plains. The little river Amenanus, or Amenas, which flowed through the city, was a very small stream, and could never have been navigable. Catania was sacked by the Vandals of Gaiseric in 440–441. After a period under the Ostrogoths, it was reconquered in 535 by the Eastern Roman Empire, under which (aside from a short period in 550–555) it remained until the 9th century. It was the seat of the Byzantine governor of the island. Catania was under the Islamic emirate of Sicily until 1072, when it fell to the Normans of Roger I of Sicily. Subsequently the city was ruled a bishop-count. In 1194–1197 the city was sacked by German soldiers during after the conquest of the island by emperor Henry VI. In 1232 it rebelled to the former's son, Frederick II, who later built a massive castle, Castello Ursino and also made Catania a royal city, ending the dominance of the bishops. Catania was one of the main centers of the Sicilian Vespers revolt (1282) against the House of Anjou, and was the seat of the incoronation of the new Aragonese king of Sicily, Peter I. In the 14th century it gained importance as it was chosen by the Aragonese as a Parliament and Royal seat. Here, in 1347, it was signed the treaty of peace that ended the long War of the Vesper between Aragonese and Angevines. Catania lost its capital role when, in the early 15th century, Sicily was turned into a member of the Crown of Aragon, and kept its autonomy and original privileges specially during the period from 1282 to 1410. In 1434 King Alfonso V founded here the Siciliae Studium Generale, the oldest university in the island. With the unification of Castile and Aragon (early 16th century), Sicily became part of the Spanish Empire. It rebelled against the foreign government in 1516 and 1647. 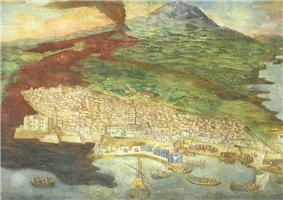 In 1669 the city's surroundings suffered great material damage from an eruption of Mount Etna. The city itself was largely saved by its walls that diverted most of the lava into the port. Afterwards in 1693 the city was then completely destroyed by a heavy earthquake and its aftershocks. The city was then rebuilt in the Baroque architecture that nowadays characterizes it. Catania was one of the vanguards of the movement for the Sicilian autonomy in the early 19th century. In 1860 Giuseppe Garibaldi's expedition of the Thousand conquered Sicily for Piedmont from the Kingdom of the Two Sicilies. Since the following year Catania was part of the newly unified Italy, whose history it shares since then. During World War II Catania was repeatedly bombed by the Allies, starting from 5 June 1940, and some 100,000 of its inhabitants were moved to the neighboring villages. It was evacuated by the Germans on 5 August 1943 and liberated by the British 8th Army. After the conflict, and the constitution of Italian Republic (1946), the history of Catania was, like the history of other cities of southern Italy, an attempt to catch up with the economic and social development of the richer northern regions in the country and to solve the problems that for historic reasons plague the Mezzogiorno, namely a heavy gap in industrial development and infrastructures, and the threat of the mafia. This notwithstanding, during the 1960s (and partly during the 1990s) Catania enjoyed a development and an economic, social and cultural effervescence. In the first decade of the 21st century, Catania economic and social development somewhat faltered and the city is again facing economic and social stagnation. This was aggravated by the economical crisis left by the Forza Italia administration of mayor Scapagnini in 2008. The Köppen Climate Classification subtype for this climate is "Csa" (Mediterranean Climate). It has hot and long Summers, the hottest in the whole Italy (a feature characterizing nearly every months). 40 °C (104 °F) are surpassed almost every year a couple of times, with record highs over 45 °C (113 °F). Winters are mild (not rare peaks around 20 °C) and wet. Most of precipitations are concentrated from October to March, leaving late Spring and Summer virtually dry (some years rain lacks for 3–4 months). The city receives around 500 mm of rain per year, although amount can highly vary from year to year (wettest over 1200 mm, dryest under 250 mm). During Winter nights occasionally lows can go under 0 °C (32 °F). Highs under 10 °C (50 °F) are rare as well. Snowfalls, due to the presence of Etna, are very rare, latest occurred on December 17, 1988. The Metropolitan Area of Catania: in red, the city and the hinterland comuni forming the urban belt; in yellow, the province. These comuni form a system with the centre of Catania sharing its economical and social life and forming an organic urban texture. The Metropolitan Area of Catania should not be mistaken for the Province of Catania, a far broader administrative area that includes 58 comuni and 1,081,915 inhabitants, but does not form an urban system with the city. As of December 2007, there are 298,597 people residing in Catania, of whom 47.2% are male and 52.8% are female. Minors (people under age 18) totalled 20.50 percent of the population compared to pensioners who number 18.87 percent. This compares with the Italian average of 18.06 percent (minors) and 19.94 percent (pensioners). The average age of Catania residents is 41 compared to the Italian average of 42. In the five years between 2002 and 2007, the population of Catania declined by 3.35 percent, while Italy as a whole grew by 3.85 percent. The reason for this population decline in the Comune di Catania is mainly due to a large segment of the population leaving the city centre to go to live in the up-town residential areas of the comuni of the Metropolitan Area. As a result of this, while the population in the comune di Catania declines, the population of the hinterland comuni increases making the overall population of the Metropolitan area of Catania increase. The current birth rate of Catania is 10.07 births per 1,000 inhabitants compared to the Italian average of 9.45 births. As of 2006, 98.03% of the population was Italian. The largest immigrant groups come from Sub-Saharan Africa: 0.69%, South Asia: 0.46%, and from other European countries (particularly from Ukraine and Poland): 0.33%. The symbol of the city is u Liotru, or the Fontana dell'Elefante, assembled in 1736 by Giovanni Battista Vaccarini. It portrays an ancient lavic stone elephant and is topped by an Egyptian obelisk from Syene. Legend has it that Vaccarini's original elephant was neuter, which the men of Catania took as an insult to their virility. To appease them, Vaccarini appropriately appended elephantine testicles to the original statue. The Sicilian name u Liotru is a phonetic change of Heliodorus, a nobleman who, after trying without success to become bishop of the city, became a sorcerer and was therefore condemned to the stake. Legend has it that Heliodorus himself was the sculptor of the lava elephant and that he used to magically ride it in his fantastic travels from Catania to Constantinople. Another legend has it that Heliodorus was able to transform himself into an elephant. 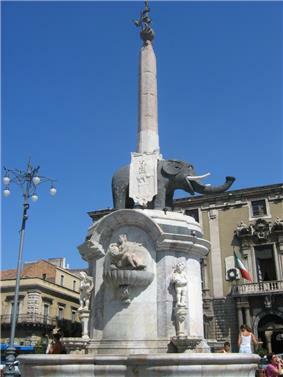 The presence of an elephant in the millenary history of Catania is surely connected to both zooarcheology and popular creeds. In fact, the prehistoric fauna of Sicily from the Upper Paleolithic, included dwarf elephants. Paleontologist Othenio Abel suggested that the presence of dwarf elephants in Sicily may be the origin of the legend of the Cyclops. Ancient Greeks, after finding the skulls of dwarf elephants, about twice the size of a human skull, with a large central nasal cavity (mistaken for a large single eye-socket) supposed that they were skulls of giants with a single eye. The Catanian Museum of Mineralogy, Paleonthology and Vulcanology holds the integral unburied skeleton of an Elephas falconeri in an excellent state of conservation. The first inhabitants of Etna molded such lavic artifact to idolize the mythical proboscidian. The city has been buried by lava a total of seventeen times in recorded history, and in layers under the present day city are the Roman city that preceded it, and the Greek city before that. Many of the ancient monuments of the Roman city have been destroyed by the numerous seisms. Currently, different ancient remains can be seen and visited in the city-centre, as part of an archaeological park (Parco Archeologico Greco-Romano di Catania). The Church of Saint Francis of Assisi backs the Cavea of the Greek-Roman Theatre. Roman Thermal Baths of Santa Maria dell'Indirizzo. 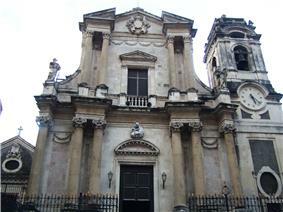 Church of the Santo Carcere or Sant'Agata al Carcere (1760). This temple includes the ancient jail where Saint Agatha was allegedly imprisoned during her martyrdom. Saint Agatha by the Borough (1669, destroyed in 1693 and rebuilt in 1709). The "Borough" (il Borgo) is an inner district of Catania. Church of Santa Maria dell'Itria or Odigitria). Church of the Santissimo Sacramento Ritrovato (1796). Sanctuary of Our Lady of Ognina (1308). Ognina is the maritime quarter and the main fishing pole of Catania. Many bareboats and umpteen smacks gather and crowd here all year round. In its close vicinities there is a cylindric tower, known as Saint Mary's Tower (Torre Santa Maria), which was restructured in the 16th century to prevent the frequent plunders of the Saracen pirates. The church is the result of the gradual modification of the Greek Temple Athena Longatis or Parthenos Longatis that existed on the steep reef. This cult was imported from a Boeotian region of Greece called Longas from where the first Hellenic settlers of this borough probably came. 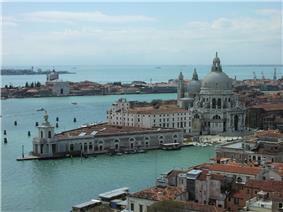 After the earthquake of 1693 it was sobriously rebuilt on the same place but with a different orientation. Castello Ursino, built by emperor Frederick II in the 13th century. Palazzo degli Elefanti, designed by Giovan Battista Vaccarini. It houses the Town Hall. The city of Catania is divided in ten administrative areas called Municipalità (Municipalities). The current administrative set-up was established in 1995, modifying previous set-ups dating back to 1971 and 1978. 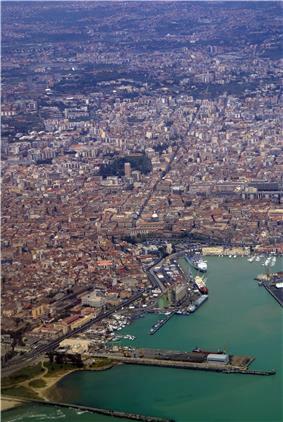 Catania, after Palermo, is the second economic and industrial hub of Sicily. The city is famous for its mainly petrochemical industry, and the extraction of sulphur. In the year 2000, according to Censis, Catania was the 14th richest city in Italy, with a GDP of US$ 6.6 billion (€ 6.304 billion), which was 0.54% of the Italian GDP, a GDP per capita of US$ 21,000 (€ 20,100) and an average GDP per employee of US$ 69,000 (€ 66,100). In the late-19th century and early-20th century, Catania began to be heavily industrialised, with its several factories and chimneys, often to the extant that it was referred to as Southern Italy's "Manchester." The economy of Catania suffered heavily from the bad effects of World War I, and was marked by an economic crisis and recession that culminated in the 1920s. Since then, the city lost its industrial and entrepreneurial importance. In the 1930s, Catania remained a small fishing town with derelict and disused industries. However, after the destruction of World War II, Catania's economy began to re-grow in the late-1950s and early-1960s. As a matter of fact, the city's economic growth was so rapid and dynamic that it was often nicknamed the "Milan of the South", or in Italian "Milano del Sud". This rapid economic growth prompted a great number of Sicilians living in the more rural areas, or smaller towns such as Enna, Ragusa and Caltanissetta, to move to the city to seek new jobs. Today, Catania, despite several problems, has one of the most dynamic economies in the whole of Southern Italy. It still has a strong industrial and agricultural sector, and a fast-growing tourist industry, with many international visitors coming to visit the city's main sights and the nearby Etna volcano. It contains the headquarters or important offices of companies such as STMicroelectronics, and also several chemical and pharmaceutical businesses. There have been several new business developments to further boost Catania's economy, including the construction of Etnapolis, a huge and avant-garde commercial centre designed by Massimiliano Fuksas, the same architect who designed the FieraMilano industrial fair in Milan, or the Etna Valley, where several high-tech offices are located. 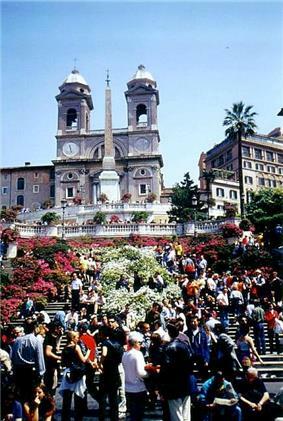 Tourism is a fast-growing industry in Catania. Lately the administration and private companies have made several investments in the hospitality industry in order to make tourism a competitive sector in Catania and its province. Nearby, just 12 kilometres (7 miles) from the city, there is Etnaland, a big theme park, which is the largest of its kind in Southern Italy and which attracts thousands of tourists, not only from Sicily, but also from the rest of Italy. Historical building of the University, in the city centre. Nowadays the different faculties are hosted in different buildings around town. The University of Catania dates back to 1434 and it is the oldest university in Sicily. Its academic nicknames are: Siculorum Gymnasium and Siciliae Studium Generale. Nowadays it hosts 12 faculties and over 62,000 students, and it offers undergraduate and postgraduate programs. 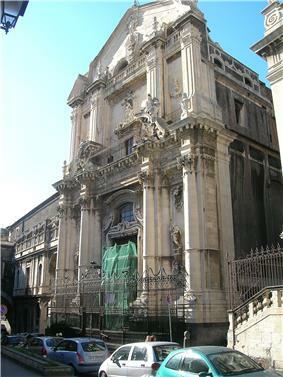 Catania hosts the Scuola Superiore, an academic institution linked to the University of Catania, aimed at the excellence in education. The Scuola Superiore di Catania offers undergraduate and postgraduate programs too. Apart from the University and the Scuola Superiore Catania is base of the prestigious Istituto Musicale Vincenzo Bellini an advanced institute of musical studies (Conservatory) and the Accademia di Belle Arti an advanced institute of artistic studies. Both institutions offer programs of university level for musical and artistic education. 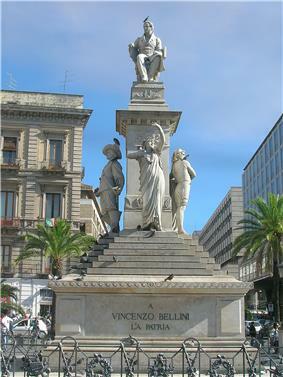 The opera composer Vincenzo Bellini was born in Catania, and a museum exists at his birthplace. 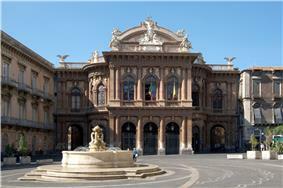 The Teatro Massimo "Vincenzo Bellini", which opened in 1890, is named after the composer. The opera house presents a variety of operas through a season, which run from December to May, many of which are the work of Bellini. Giovanni Verga was born in Catania in 1840. He became the greatest writer of Verismo, an Italian literary movement akin to Naturalism. His novels portray life among the lower levels of Sicilan society, such as fishermen and stonemasons, and were written in a mixture of both literary language and local dialect. Francesco Longo Mancini was a painter known for paintings of nudes who was born in Catania in 1880. The city is base of the newspaper La Sicilia and of the TV-channel Antenna Sicilia also known as Sicilia Channel. Several others local television channels and free-press magazines have their headquarters in Catania. In the late 1980s and during the 1990s Catania had a sparkling and unique popular music scene. Indie pop and indie rock bands, local radio station and dynamic independent music record labels sprung. As a result, in those years the city experienced a vital and effervescent cultural period. Artists like Carmen Consoli and Mario Venuti and internationally known indie rock bands like Uzeda came out of this cultural milieu. The 2012 film, Acqua Fuori Dal Ring is set in Catania and was filmed on location in the Librino neighborhood and Black Lava Fields of Mount Etna. The city is the home of Amatori Catania rugby union team, Calcio Catania football team and Orizzonte Catania, the latter being a women's water polo club, winning eight European Champions Cup titles from 1994 to 2008. Noted Italian basketball coach Ettore Messina is a native of Catania. The city also hosted the first ever qualification tournament for the Rugby World Cup Sevens in 1992, and the associated Etna Cup, which was won by the host Sicily team. In addition, the Catania Elephants are currently members of the Italian Football League. The city's patron saint is Saint Agatha, who is celebrated with a religious pageantry, the Festival of Saint Agatha, on February 5 every year. Catania also hosted the 2011 FIE Fencing World Championships. Catania has a unique cuisine, with strong Sicilian traits. Dishes such as Pasta alla Norma are from the city. Pasta alla Norma is a pasta dish made out of macaroni-like penne, tomato sauce, largely sliced aubergines, and often topped with salty ricotta, or ricotta salata in Italian. Granita, a popular flavoured sherbet, is believed to hail from the city too. Blood oranges, such as the famous tarocco, are common to the city and others. Another famous plate is horse's meat, usually cooked on coals and sold on the streets. Catania has a commercial seaport (Catania seaport), an international airport (Catania Fontanarossa), a central railway station (Catania Centrale) and it is a main node of the Sicilian motorway system. The motorways serving Catania are the A18 Messina-Catania and the A19 Palermo-Catania; extensions of the A18 going from Catania to Syracuse and to Gela are currently under construction. 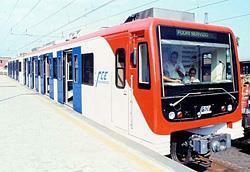 The Circumetnea is a small-gauge railway that runs for 110 km (68 mi) from Catania round the base of Mount Etna. It attains the height of 976 m (3,202.10 ft) above sea level before descending to rejoin the coast at Giarre-Riposto to the North. In the late 1990s the first line of an suburban area of Nesima) and Galatea-Stesicoro (extending the underground railway from the station Galatea to Piazza Stesicoro, in the heart of town) are currently under construction. ^ Roman writers fluctuate between the two forms Catana and Catina, of which the latter is, perhaps, the most common, and is supported by inscriptions (Orell. 3708, 3778); but the analogy of the Greek Κατάνη, and the modern Catania, would point to the former as the more correct. ^ a b c d e "Catania history – Catania culture – Catania – attractions in Catania – art Catania – history guide Catania – Italy Katane". Travelplan.it. Retrieved 2010-06-01. 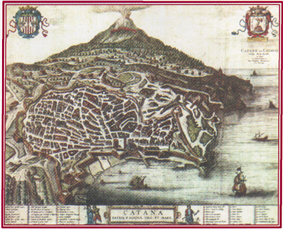 ^ "The meaning of the name Catania". Sicilia.indettaglio.it. 2006-11-04. Retrieved 2011-04-05. ^ Thuc. vi. 3; Strabo vi. p. 268; Scymnus 286; Scylax § 13; Stephanus of Byzantium s. v.
^ Aristotle, Pol. ii. 9. ^ Diodorus xi. 49, in 66; Strabo l.c. ; Pind. Pyth. i., and Schol. ad loc. ^ Thuc. vi. 50–52, 63, 71, 89; Diod. xiii. 4, 6, 7; Plut. Nic. 15, 16. ^ Diod. xiv. 15, 58, 60. ^ Diod. xvi. 69; Plut. Timol. 13, 30–34. ^ Diod. xix. 110, xxii. 8, Exc. Hoesch. p. 496. ^ Diog. Laert. ix. 2. § 1. ^ Athen. i. p. 22, c.
^ Strabo vi. p. 269; Pausanias x. 28. § 4; Conon, Narr. 43; Philostr. Vit. Apoll. v. 17; Gaius Julius Solinus 5. § 15; Gaius Julius Hyginus 254; Valerius Maximus v. 4. Ext. § 4; Lucil. Aetn. 602-40; Claudian. Idyll. 7; Silius Italicus xiv. 196; Auson. Ordo Nob. Urb. 11. ^ Cicero In Verrem iii. 4. 3, 83, iv. 23, 45; Livy xxvii. 8. ^ Strabo vi. pp. 268, 270, 272; Dion Cassius iv. 7. ^ Pliny iii. 8. s. 14; Ptol. iii. 4. § 9; Itin. Ant. pp. 87,90, 93, 94. ^ "The Metropolitan Area of Catania defined by ANCI Sicilia (National Association of Comuni Italiani)". Anci.sicilia.it. Retrieved 2011-04-05. ^ "Santissimo Sacramento Ritrovato – Home". Sacramentoritrovato.com. 2009-03-16. Retrieved 2009-07-25. ^ "Athena Longatis". Mythindex.com. Retrieved 2011-04-05. ^ "Home Page Parrocchia N.S. di Monserrato". Parrocchie.it. Retrieved 2009-07-25. ^ La Mecca is not the Saudi holy city, but a vernacular Catanian word that identifies a "silk mill" that existed, in effect, in its vicinity. ^ "La ricchezza del territorio italiano". webcache.googleusercontent.com. Archived from the original on 2004-03-18. Retrieved 2010-06-01. ^ "home". Centroetnapolis.it. Retrieved 2010-06-01. ^ "Oggi la chiamano Etna Valley: i progetti, le aziende, il lavoro nel territorio di Catania". Etnavalley.com. 2010-04-29. Retrieved 2010-06-01. ^ "Musical Institute Vincenzo Bellini – Official site". Istitutobellini.it. Retrieved 2011-04-05. 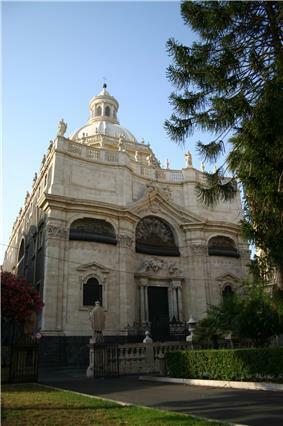 ^ "Academy of Fine Arts of Catania". Italian official site. Retrieved 2011-04-05. ^ "Phoenix Sister Cities". Phoenix Sister Cities. Archived from the original on 2013-07-24. Retrieved 2013-08-06. ^ Jérôme Steffenino, Marguerite Masson. "Ville de Grenoble –Coopérations et villes jumelles". Grenoble.fr. Retrieved 16 May 2013. Amico, Vito Maria (1740). Catana Illustrata. Correnti, Santi (1981). La Città Semprerifiorente. Catania: Greco. Correnti, Santi (2001). Cataniamia. Catania: Greco. Correnti, Santi; Santino Spartà (2007). Le strade di Catania, Rome. Newton & Compton. Various. Enciclopedia di Catania. Tringale. 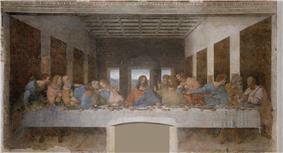 Other material is translated from the Italian WorldHeritage site.